Ever since Jennifer Johnson started working in financial services in the 1990s, she felt something was missing in all the technology available to traders who want to get information about stocks. “With the way [the data] is presented, it’s really hard to get a sense of what’s happening in the overall market,” she says. Sure, programs offered by the likes of Bloomberg and Yahoo Finance make it easy to look up individual stocks in real time, but they present the information in a mostly linear fashion—with lists and hyperlinks related to that one security. “You need to understand it in context,” Johnson says. So last year, Johnson co-founded New York-based Visible Market and created an app that uses game-like design and animation to display real-time information about securities in the context of broader market trends. In the 14 months since the company debuted the app, called StockTouch, 96,000 people have installed it on their iPads or iPhones and are logging about a half-million minutes on it per month. In 2011, Apple Rewind crowned StockTouch the No. 1 finance app in the app store. Now Visible Market, which has raised $800,000 in seed funding, is going after a larger and more lucrative market opportunity: institutional finance. Johnson says the company is working on a software development kit that financial-services companies will be able to use to tailor StockTouch to the needs of their employees. “They’ll be able to take it in-house and build their own data into it themselves,” says Johnson, who hopes to roll out the development kit early next year. 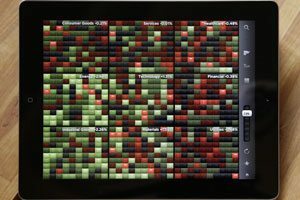 Here’s how StockTouch works: The opening screen displays 1,400 stocks sorted into nine industry segments. The industries are organized into heat maps, with each company appearing on a tile that’s positioned and color-coded in a way that corresponds to that company’s stock performance. Touch a tile, and you’re brought instantly to a screen that displays everything about that stock, from its market cap and dividend yield, to links to stories that explain the company’s share performance.